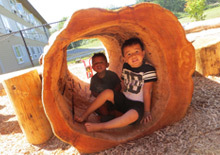 Nestled between the Lummi Bay and Bellingham Bay in Northwest Washington State, four tribal college early childhood education programs brought their knowledge together among the thicket of tradition and scenery on the Lummi Indian reservation. 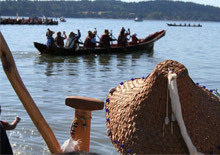 The Wakanyeja Early Childhood Education Initiative tribal college grantees of Northwest Indian College, College of Menominee Nation, Southwestern Indian Polytechnic Institute (SIPI) and Ilisagvik College gathered last week for their annual Sacred Little Ones convening on the Lummi reservation. 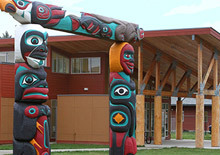 The grantees of this Kellogg-funded initiative joined up to share their experiences at their tribal college sites and expand upon each other’s emergent specialized knowledge and give a report on how their initiatives are impacting not only the young learners, but also the programs, communities and the tribal college students studying alongside in the program. This break-through initiative on how we teach young learners incorporates the cultural aspects of learning while preparing the needs of the students to be more successful in the classroom. The TCU grantees presented their expertise and conveyed their best practices they have identified in now their third year participating in the program. “We did an activity where we choose a Lummi legend, The Crow and the Bear story. The moral of the legend is to not be a copy cat because you might get hurt. Instead of following the assignment (and being a copy cat) to use the Gingerbread Man framework, we did a Lummi legend. We worked together to illustrate the legend for Lummi children.” Sunshine Bob and the Sacred Little Ones team will be submitting their storybook to the Lummi culture commission for approval and feedback before they are distributed for use in early learning centers serving Lummi children and families. The SIPI team discussed the complexities of integrating tribal language into literary text. The team would like to respect local tribal values regarding sharing language in text. The SIPI team would like to develop books with the collaboration of local community. During the Saturday session the CMN team presented a workshop on making storybooks that we can use with our young children in our Learning Environment. It was an abbreviated hands-on practice to give an overview of the process. The team feels it is easier to go back home and produce its own. The team realized that this doable and it has the resources and the basic skills. to produce fun, culturally relevant classroom material. For their participation in the activity, some freshly-harvested maple syrup from the Menominee Nation was presented to each cohort by the College of Menominee Nation.